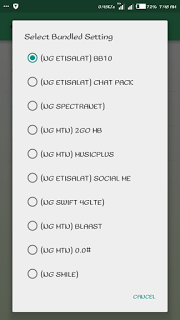 Everything working for good as I will be showing you how to connect your etisalat unlimited bb10 sub with the use of a VPN known as "Tweakware" By now, most of you must have been enjoying the update written by Techbmc few hours ago, on how to connect or set your Etisalat bblite to surf flawlessly on your Android mobile phone with the use of UC Mini Handler Browser. In case you find it difficult to connect then, here is another best alternative you can make use of while using the Etisalat bblite. We want to make sure that all our fans are browsing free this time around. So, as you are following our Articles, We promise that you have nothing to loose. With tweakware VPN, you can surf the net with etisalat bis on your android device. Hey, remember it used be unlimited when you are browsing with other VPN like psiphon and as well UC mini browser. But now Tweakware has added it to their bundle as its now capped for 200MB. Note: its not capped when using other VPN free servers but only comply to Tweakware VPN bundle free server. This effect was made on their updated tweakware VPN app, as you can now see Etisalat BB10 on the available list of tweak once you launch the app. So if you have an updated tweakware go ahead and select Etisalat BB10 and use free server. Where can I Download the latest Tweakware app? 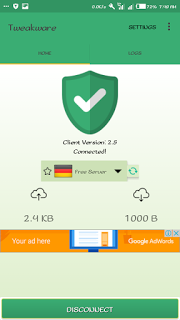 To download Tweakware VPN apk android app click HERE. After downloading launch and you will get to see all the bundled settings. Enjoy and share to friends, if you want to join our whatsapp group kindly drop your number with the comment box below.